Love and attention are very important aspects of my poodle breeding program, for both my adults and puppies. My puppies receive all of the necessary socialization and stimulation they need for healthy development, including implementation of Puppy Culture. The early training and socialization that my puppies receive helps them to have a smooth transition into their forever homes. It also helps me to screen the best candidates for service and therapy dog needs. 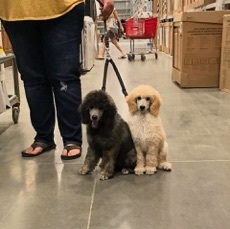 Their individual personalities have the chance to develop in the best environment for growth at Noir Poodles. My poodle puppies start socialization at birth, with plenty of love and human interaction in my home. My daughter and mom assist me in giving all of my puppies individual attention. They grow up listening to all of the normal "house" noises from cleaning, dogs, television, and children. My puppies learn important social skills by remaining with their litter mates until they are 9 weeks old. My puppies start using the bathroom inside on litter and washable potty pads. When weather permits, they are also taken outside to use the bathroom on grass as they mature. I have a doggy door in my puppy room that some of my puppies start using to go outside to use the bathroom. Nine week old puppies require consistency with house training in their new homes. I recommend that new puppy owners use crates and exercise pens during times when puppy’s behavior cannot be observed by a responsible adult. Crates and exercise pens are effective tools in preventing destructive behavior and reinforcing potty training. Puppies teeth for the first year of life. Chewing is recommended for the lifelong oral health of a dog, but proper chewing habits must be learned. I recommend that puppies NEVER be left to roam the house unsupervised. Prevention is always best, but accidents sometimes happen. Grannick's Bitter Apple spray is helpful to spray on furniture, if unwanted chewing occurs. Some veterinarians and pet supply stores carry bitter apple spray. It can also be purchased online. THE BEST SOLUTION TO UNWANTED CHEWING IS FREEDOM WITH SUPERVISION, AND PLENTY OF SAFE CHEW TOYS. 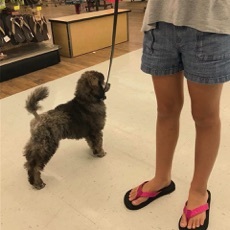 Socialization starts in my home, but it is critical to continue exposing Puppy to different sights, sounds, places, and people as Puppy matures. Puppy Culture emphasizes the lifelong benefits of early socialization. The critical socialization period is from 3-12 weeks old. Families should be prepared to finish the last three weeks of this critical socialization period with their new puppy. I strongly recommend all of my puppy families watch Puppy Culture prior to bringing home their new poodle puppy. 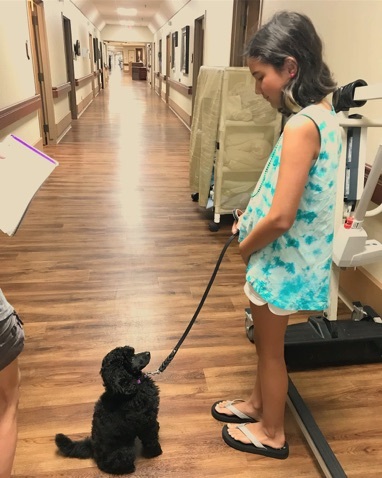 Puppy Culture effectively provides the tools to help families communicate effectively with their puppies in a positive way. 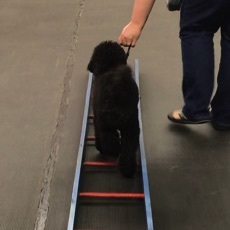 Attending the right puppy class is also an invaluable resource for safe canine socialization and training. Dog trainers at puppy class help families know how to work with puppies if there are specific training issues that need addressed. Moyen Poodles are intelligent and highly trainable. They thrive with consistency and positive training. Agility, rally, obedience, scent work, dock diving, and barn hunt are different forms of advanced performance training. Poodles often excel and love exploring these different avenues of trianing. It is important not to start advanced physical training until joints have had a chance to fully develop.